First Annual Millon Boys Lacrosse Camp! 25 years and over 28,000 young athletes have come through Millon camps. 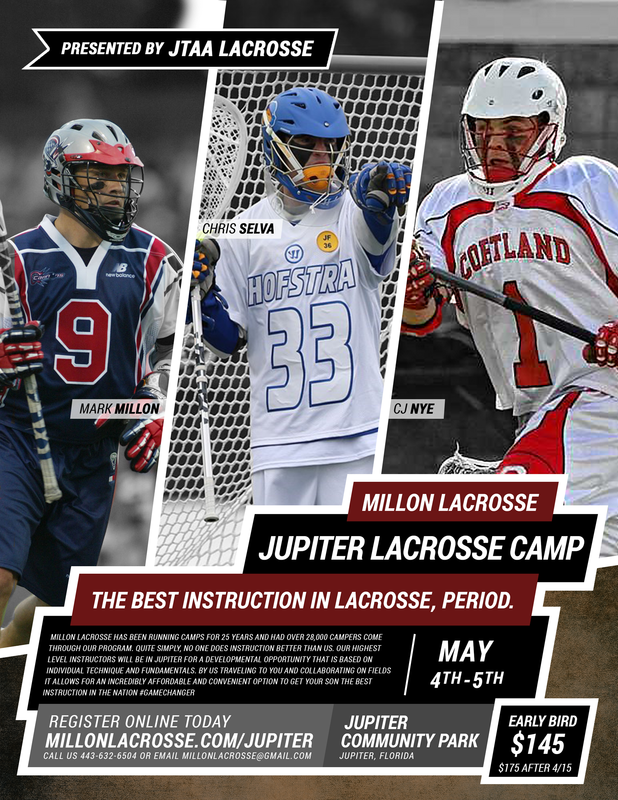 Regarded as the best instructional camp in the nation. Mark is regarded as one of the top individual offensive lacrosse instructors in the nation. He has a unique methodology that has been refined over 23 years of running camps. He has spoken 5 times at the US lacrosse national convention, coaches at the Gilman school in Baltimore, director of operations and player development for Team 91 Maryland, has two young boys which he coaches both of their teams. At a Millon custom camp Mark does every single offensive skill demo. After instructional demo the players go out and rep out the skill. This is invaluable. Mark will provide a defensive instructor that will do all skills and drills at that positions. This camp is open to attack, midfield and defense. Hofstra University ALL CAA Goalie, Senior Co-Captain, Former Assistant at University of Delaware. Chris, originally from Parkland, FL played at Hofstra University for Coach Seth Tierney and was an all CAA selection and captain during his senior year. Since graduation Chris has been very active on the goalie camp and clinic instructional circuit. Regarded as one of the top goalie instructors in the nation. Cortland State All-SUNYAC and All-ECAC Defender, Team captain, current Assistant Coach at Cortland. Email millonlacrosse@gmail.com with player name, position, and age to register. Use the link above to finalize payment and secure your spot. THIS EVENT IS HOSTED BY JTAA LACROSSE. * This is a JTAA Lacrosse fundraiser. A portion of the money raised will go to fund the Jupiter Tide Lacrosse Program to be used for worthy causes such as Lacrosse scholarships, grants, JTAA Lacrosse program development and enhancement, special needs in JTAA, and any selected local non-profit educational and non-profit sports causes that JTAA Lacrosse deems appropriate. ABOUT: The JTAA Tide Youth Rec Lacrosse program is entering its 19th year and is now the largest youth rec lacrosse program in the southeastern United States. Our programs are for boys and girls starting with 6U on up to 15U.